Hello everyone my name is Jordan. 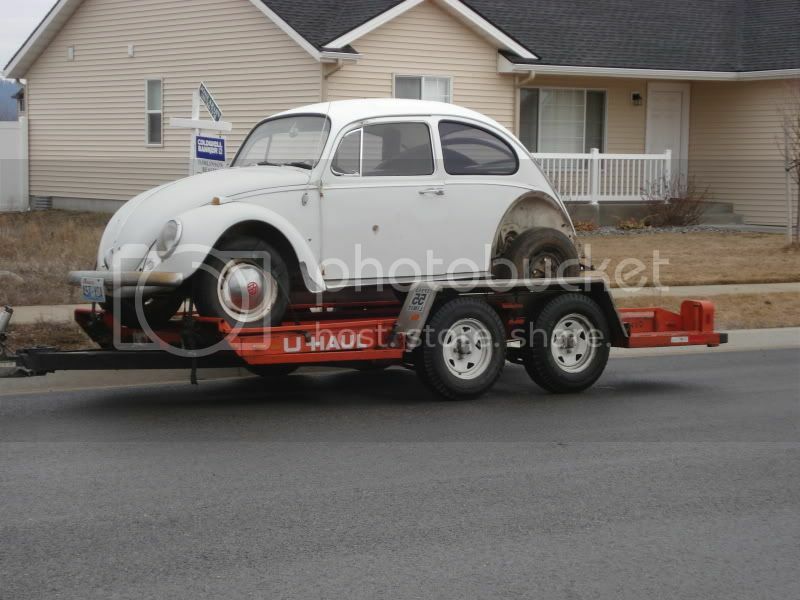 I just bought Dave66's bug. 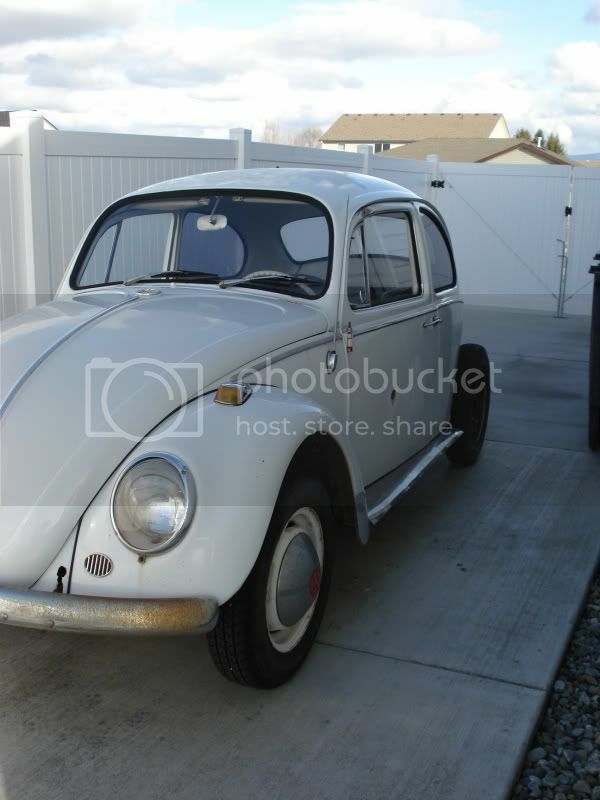 It's a 66 Bug that needs a lot of loving. I'm a newbie to the Bug thing but I'm eager to learn. Ready to take this project to the next level. I have a lot ahead of me so you will probably have me asking questions all the time on here. Here is the Bug still on the trailer in front of my house. Welcome, and have fun with it. I almost bought that car last year, but ended up with a Karman Ghia instead(gone already). Congrats on the new purchase. Make sure you put a new throttle and clutch cables in your Beetle when building it, new rubber fuel line too! 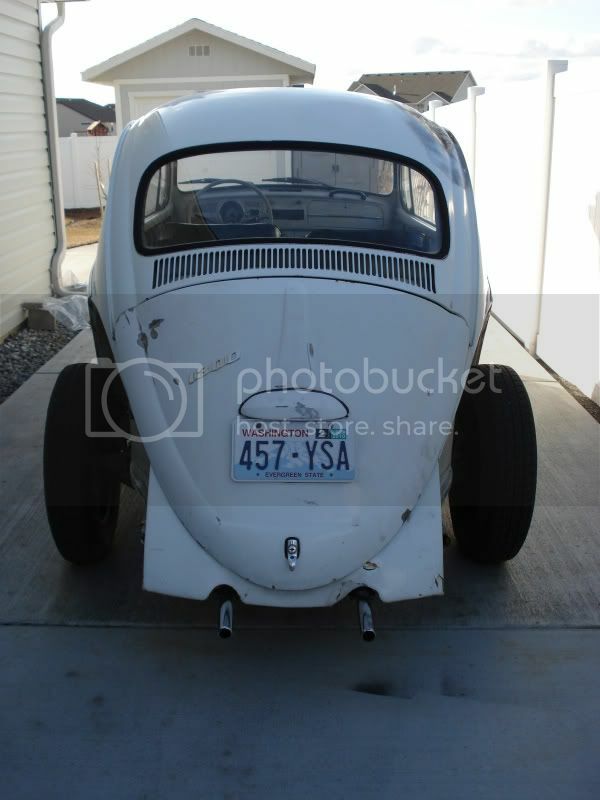 Also, the left front wheel is a Bus 15" wheel, if you need correct Beetle wheels, I have some to trade. Thanks for a little incite. I was checking it over last night and noticed my throttle is completely loose. The pedal is all the way to the floor. So I'm figuring that will need fixing. Nice spot on the bus rims. They are all actually bus rims just the back tire is a spare since the real tire was torn to shreds. I do have all 4 though. And yeah I'd be willing to trade for bug correct ones. I have 4 rims for your '66, even a couple are original two tones if I remember, maybe I have a set of original two tones. Man...I am brain dead tonight...Hey Jordan, how's the interior on your bug? I pulled some parts from a 66' last fall, and got the front and rear seats if you need them...pulled most of the dash parts too, believe they are turkis. Let me know if you need any of that stuff. LOL I think I'm going to enjoy this forum. As long as the rims have tires I'm down for a trade. Right now the car is just a roller so can't not have the tires. I'll give you a call on Tuesday or so. Have some other things to do and will be busy till then. Scott, the fronts seem decent, the backs are shot. The cloth itself that is. The springs seem ok. I also need the vents in the dash. To be honest though the interior is the least of my concern right now. The engine is not running and I need to take a look at why not. Haven't checked it but I have a feeling the 6v to 12v conversion has gone horribly wrong. 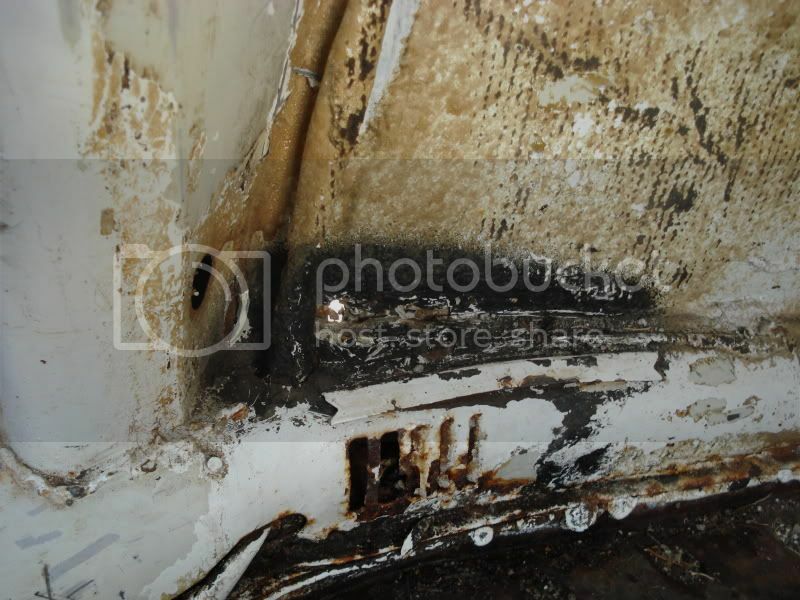 Floor pans are shot and need replacement, as well as the passenger heater channel and maybe the drivers. And then have some minor exterior rust and body work. Scott, I just get the parts when they come up I know another guy on here that could use the wheels too. Your '63 needs 15's for sure! 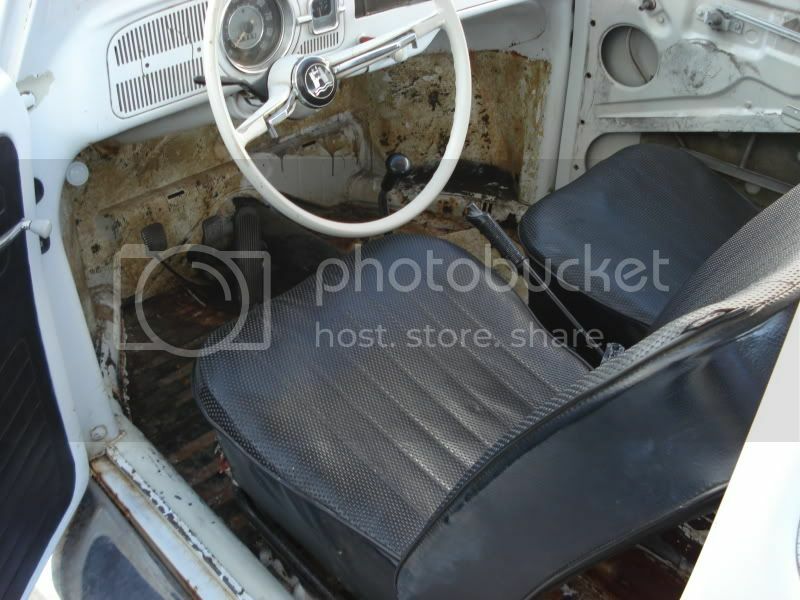 I do need a set of front Beetle seats for a '65-'66, I have '64 and older front seats to trade, or other parts. Sweet! Trade you the 66' front seats for the 15" bus wheels from Jordan?? 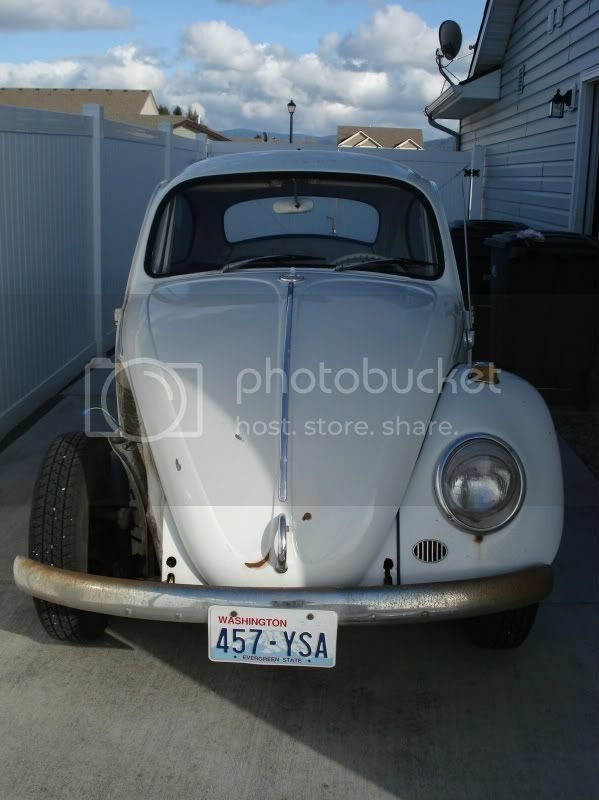 I think 2 of the 66'-67' bug wheels I have still have the two tone black/beige paint on them too!! Not too sure on their condition though. Jordan, do you mean the vents around the speedo cluster? I pulled those, but they are turkis (light blue)...Also got the speedo, and wiring stuff...oh, and the almighty 66' only emergency switch...not sure of the condition...The rear seat is in pretty good condition...don't need it, I just got it because I hated to see it go to the scrapper...think the cover is in pretty good condition....let me know if you'll be needing it, I got it stuffed up in the rafters to keep it safe (same place as the front seats! I can look today for the Beetle rims, give me a call or I can call you Scott. Sorry I haven't gotten back to you guys. I just got an internship and been super busy working late hours. Trying to finish up my requirements so I can have a week of nothing but bug work. I really want to get working on the engine. Also is there some place local that has full pans? I don't want to hassle with shipping if I don't have to. And yeah Scott those are the vents. Someone decided to cut into mine. Also just found out that the front seats are just well fitted seat covers . Has red interior underneath. A little update. I got the engine running. Still needs to be adjusted but at least I know it can run now. I'm borrowing a friends mig welder right now and would like to dig into some of this cars problems. 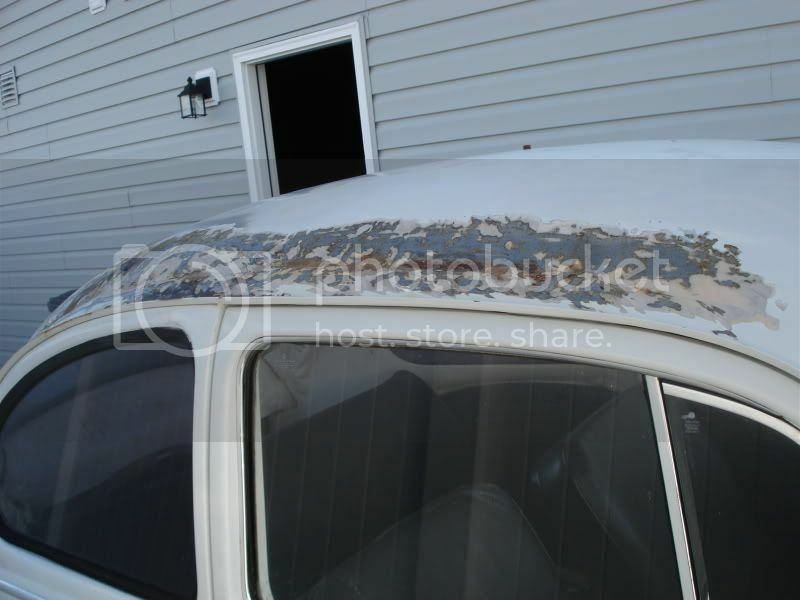 I need some advice on were to get body metal from. 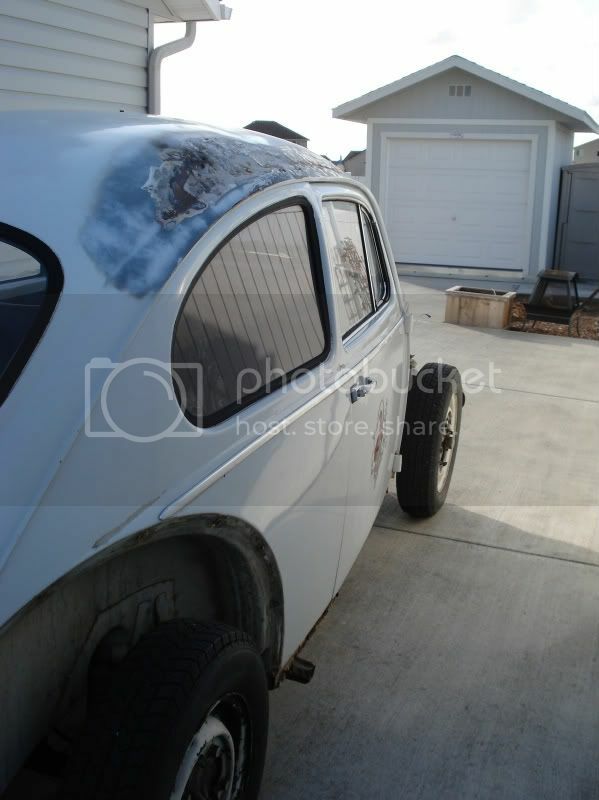 I need the common things like pans (rear halves or wholes), rear bumper brackets, left rear quarter panel just at the bottom, and the exterior pieces that rust out in the wheel wells where the heater channels run. Hole in driver side panel. Looking good! On the sheetmetal, Wolfsburg West has by far the best floor pans...but they're pricey! They also carry one step below though...for about $150 or so... Shipping is pretty expensive. We drove over to Seattle last summer and picked some up from a local shop to alleviate shipping costs. Were you talking about the left dash vent panel? I've got it. I can barely see the cut mark...what did they do? Cut it then bend it back? What's the story on the fenders? Are you missing them? It's looking really good cleaned up! I still have those rims if you're interested in trading!! I have a box of interior stuff that I pulled from that 66', I won't be needing any of it...if you could use it. It's just misc. dash parts and stuff. Yeah I have the fenders. They are in that shed. Decided to keep them off for now so those areas don't rust as fast. Thinking I may even take the other one off as well. Yes that is the dash piece I was talking about. Don't know what happened really, but whoever did it cut through part of the firewall at well. The lucky part is a found a good replacement in the box of parts that was given with the car. Before I forget again. I have a bolt dead center on my roof. You can actually see it in some of the pictures. What is that and is it needed? I think it may be leaking water into my cab. Lastly, Scott I'm still interested in those rims. It might just be a better if you call me. But to be warned the VW logo on the caps look to be hand painted with kids paint. My number is 208-651-5579.